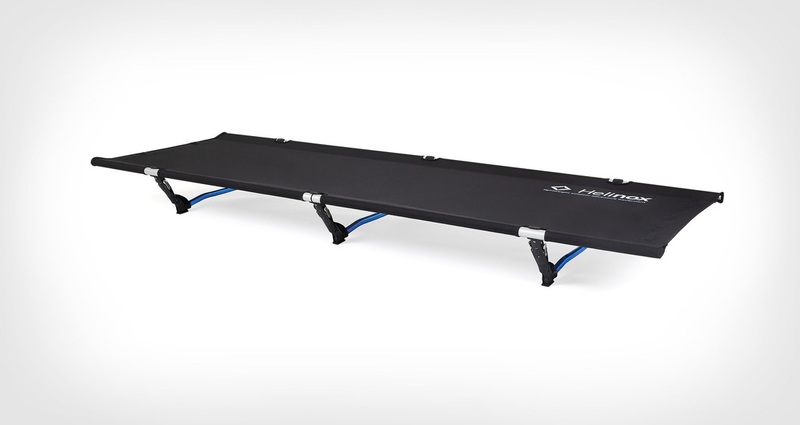 Buying a camping stretcher (or sometimes known as a camp cot) is something that many campers have on their list as an item you need for a good night’s sleep when away. Some people may call it glamping having one, but if you are outdoors and enjoying yourself, I say “go for it”!! Buying a stretcher doesn’t rate as crucial purchase when you first start camping. A good quality sleeping self inflating mat can be very effective and very comfortable. (Read: How to choose a self inflating mat for greater insight into what you need to know about them). Despite self inflating mats being a good purchase (and for many people, remains the preferred option for sleeping), others like the idea of being elevated off the ground, and find it easier to get in and out of their bed. In our case, we have both stretchers and mats - it depends on how we want to go camping (and where) on what we take. 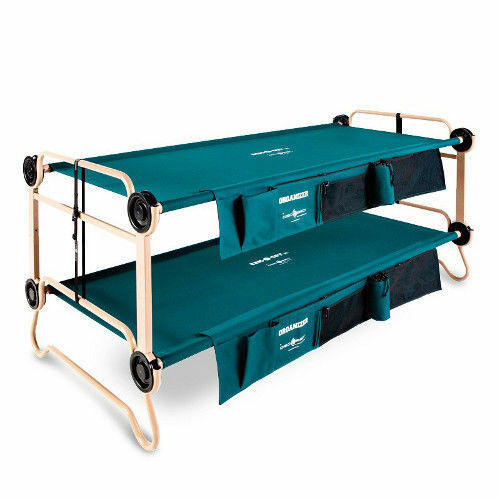 Over the years, stretchers have improved in quality and comfort, and the notion of how uncomfortable they are, is a fading memory as construction has changed, leading to greater comfort for the camper. If you are thinking about making the switch to stretchers, or investing in one for the first time, this article is for you. What sort of stretchers are there? 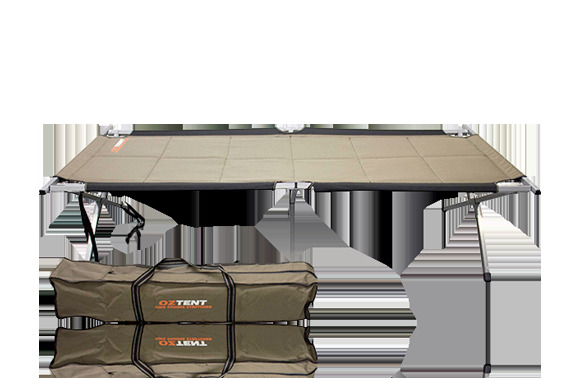 Go to any camping store/website and you will amazed with the choices available – the big camping manufacturers all do some sort of stretcher, so you will have to be guided by some of the above points on how you go about choosing one. But what sort of stretchers are out there for you? You do have a few options to choose from. There are stretchers where you have to put a few poles in for side support and wire legs are then added (a little bit of muscle required as you maneuver each end of the wire leg into the main support pole). Set up time is relatively fast – practice makes perfect. Benefits: they take up very little room when all packed up, and suit those on a tight budget. Suit children. Light to carry. Negatives : don’t always feel stable – there is a bit of movement as you turn over and some have lower weight bearing limits (Kookaburra brand is 75kg). Lowest of all the stretchers to the ground, which might be a negative for some people. Could be annoying putting in the legs every time (some wire leg stretchers have more wire legs than others). The legs don't have any padding, so could be a bit hard on some tent floors. Pictured above: Kookaburra Wire Leg Stretcher - available at most camping stores - expect to pay no more than $40. If you have a large family, and space is tight, these are a popular option as getting all the family undercover in the one camper trailer or tent. They can be used as a bunk or as 2 separate stretchers. 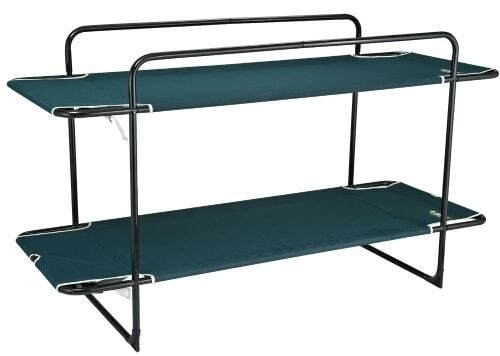 Price varies amongst models, but the standard bunks are between $100-180. Benefits: space saving when you have to stack the sleepers! Available in most camping stores. Negatives: VERY time consuming to put up as there are so many parts. Not recommended if you don’t have patience, a lot of time, and are frequently on the move. These are the fast fold up/put down stretchers as the material is already attached to a steel/alloy frame and its just a matter of unfolding them to set it up. Very popular as large variety to choose from. Benefits: Speed of set up, wide variety of brands available (and therefore wide price variations), better for heavier people than the wire stretcher mentioned above. 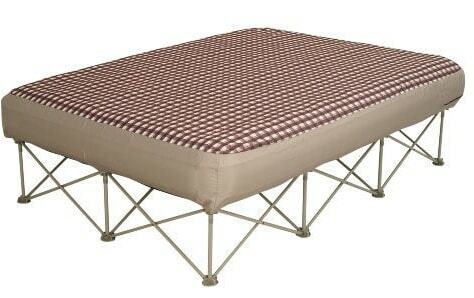 Numerous sizes to suit every person, including double/queen/king size plus varying height-off-the ground options. Sturdier. Less movement of stretcher when you turn. Can be used as a seat . Negatives: Can be more expensive, not as compact as wire leg stretchers, not all of these stretchers are as robust as others, so try a few. Kookaburra Standard Cross Leg Stretcher. These are more like folding beds – as they come with the mattress (or foam padding) as part of the stretcher itself. They tend be a lot larger as they don’t fold down as compactly as any of the previously mentioned ones but would appeal to a person who doesn’t want to go camping, as its more like home! Benefits: more like a bed than a stretcher. No need for extra padding to be provided. Good dual use for visitors at home. Many have adjustable legs. No assembly required. Sturdy, little movement when you move around on the bed. Negatives: Not as compact as previous stretchers mentioned, therefore a lot more room needed in your vehicle to carry it. For those people who are looking for innovation and lightweight camping stretchers, new models are coming onto the market to suit. Benefits: Weight and size when packed. Quality materials used. Appeals to hikers who want that bit of luxury. Negatives: Price is high due to materials used to achieve the lightweight materials and ease of use. One example is the Helinox Cot One, that uses the shock corded system as its frame – and weighing in at 2kg but able to support up to 145kg (the Lite One weighs 1.3kg) this is a camping stretcher for those who want ultralight camping comfort. Therm-A-Rest have produced their own version, though quite different from the above in looks and construction, coming in at 1.2kg packed weight. Most of the above stretchers might need a little padding at certain times of year or use. 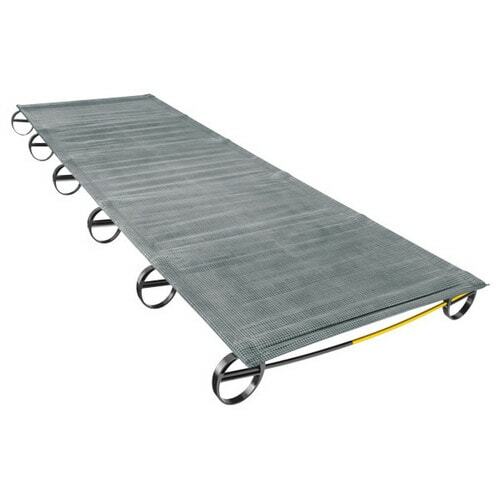 There are stretchers on the market that don’t and that is because the base of the stretcher is standard but on top is a mattress requiring pumping up. So the humble stretcher has turned into an air bed. Prices range based on size you choose, but starting from around $150 for a single bed, up to around $300 for a queen size. Negatives: Need to bring a pump, extra set up time required, could leak, bulky. What stretcher do you choose? It’s a personal decision as not everyone will have the same budget, which might factor greatly into the stretcher you choose. You need to find something that suits your camping style . Lie down on the stretcher and see how it feels. Does it rock/sway every time you move? Do you feel supported? Is it too short for you? See the bag that the stretcher comes in. How big is it? How heavy is the stretcher when packed away? Fold up the stretcher (you might have to ask a shop assistant to come over at this stage as they might not be thrilled with you doing this, but a good camping shop will understand the importance of you being able to try this out). Can you do it? Was it time consuming? Now put it back the way you found it. Was it complicated? Would you need help on an ongoing basis to do it? Would you want to be doing it frequently? Are the measurements of the stretcher suitable for you and your camping set up? These are all things you need to think about. As you can see there is a very wide range of stretchers on the market and what you choose is going to be dependent on a lot of factors and your own personal choice. Most important advice – whatever one you are considering, lie down on it. Roll over on it. And then find another stretcher that is similar in construction and do the same again. Compare them and find one that you think you can be comfortable on. If possible, try to borrow someone else’s before you buy so you can see how your body likes it! A good night's sleep when camping is important, so whether you choose a stretcher or a self inflating mat, make sure you are comfortable in your tent, and wake up feeling refreshed and ready for the day!